Born 1948 in Victoria, Lin was the only child of Scottish mother, Mary, and Aboriginal father, Bill (from the Yorta Yorta language group). His passion for art developed early. Working with his father in the family business making boomerangs and other Aboriginal artefacts, and growing up surrounded by classical art and music in a home built by his maternal grandmother, Lin absorbed influences from both cultural traditions. 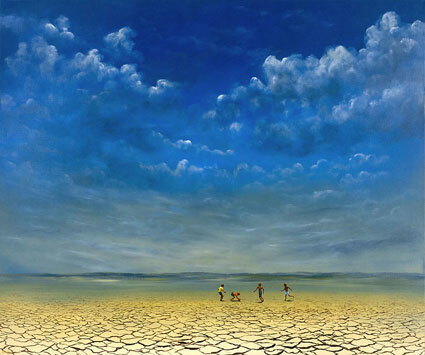 Lin Onus began painting in 1974, after initially training as a mechanic. 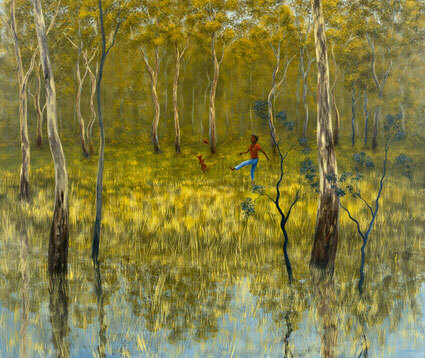 His visits to Arnhem Land, which began in 1986, deeply influenced his life and art, and enabled him to forge a unique friendship with artist and elder, Jack Wunuwun (his mentor). Onus incorporated a diverse range of mediums, methods and styles in his work: the illustrative qualities of his work being derived from Western culture and the added layered images evolving from his Aboriginal heritage. 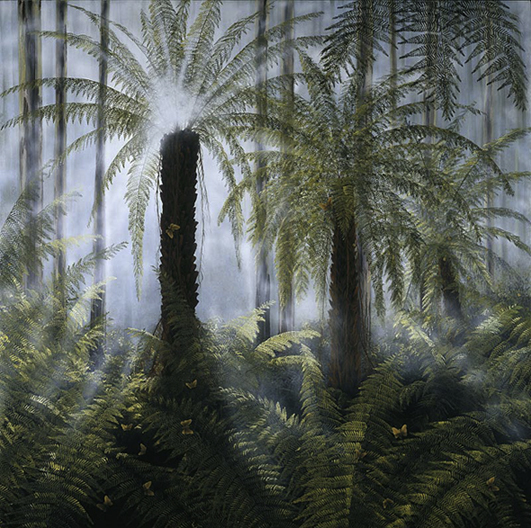 Distinctive is his use of rarrking, traditional Aboriginal cross-hatching, which was often incorporated into his super-real landscapes. Onus’ first solo exhibition in 1975 was held at the Aborigines Advancement League in Melbourne. 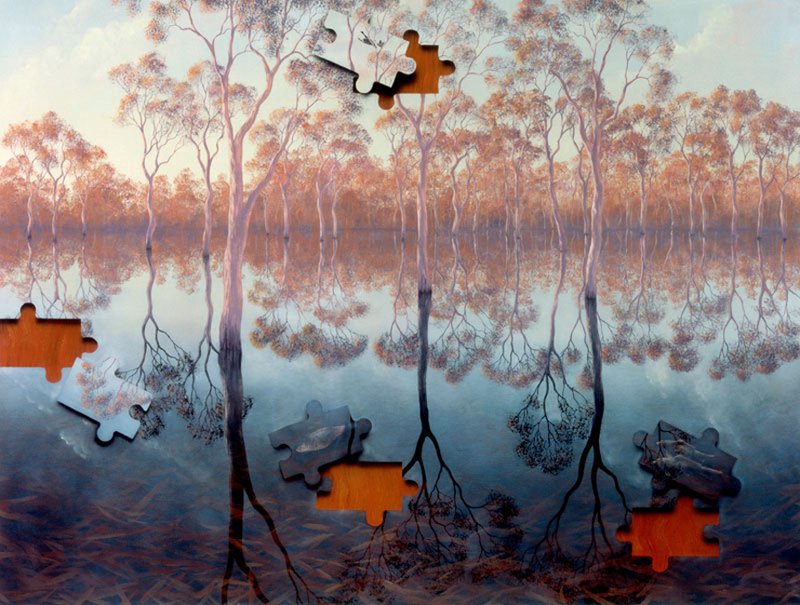 Over the following years he held 18 more solo exhibitions in Sydney, Melbourne, Brisbane and Canberra. His work has featured in many exhibitions, both in Australia, the U.K., Europe, U.S.A., Canada, and Asia. A retrospective of his work, the first for an urban-based Indigenous artist, was held as the Queensland Art Gallery’s major contribution towards reconciliation in the year 2000. Among the many awards Lin received are the National Aboriginal Art Award in 1988, and the Member of the Order of Australia, A.M., in 1993. In 1994 Lin had his first solo exhibition in Brisbane at Fire-Works Gallery, arranged by Michael Eather, fellow artist, lifelong friend and collaborator; Director of the Fire-Works Gallery. 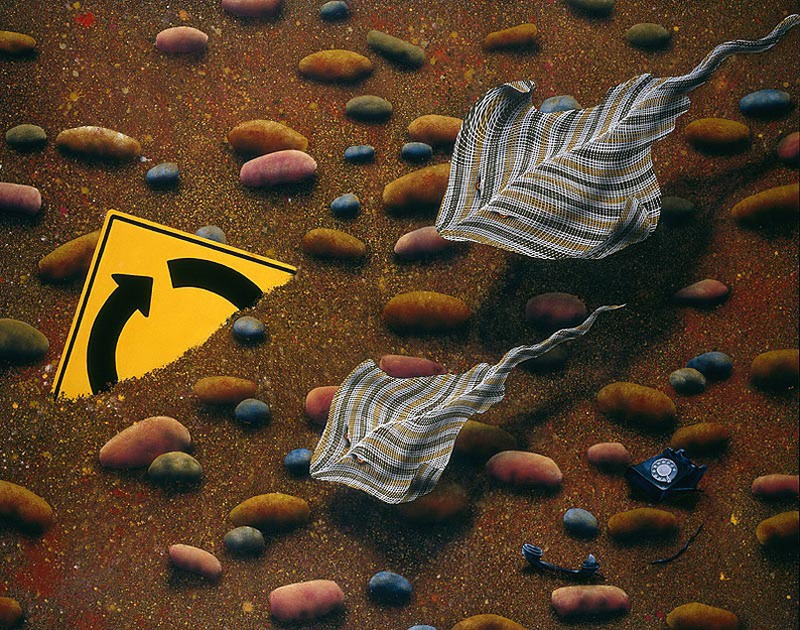 Works by Lin Onus are held in many public, corporate and private collections in Australia and overseas. One of the most successful and accessible indigenous artists of his generation, Lin Onus died prematurely at the age of 47 in 1996. 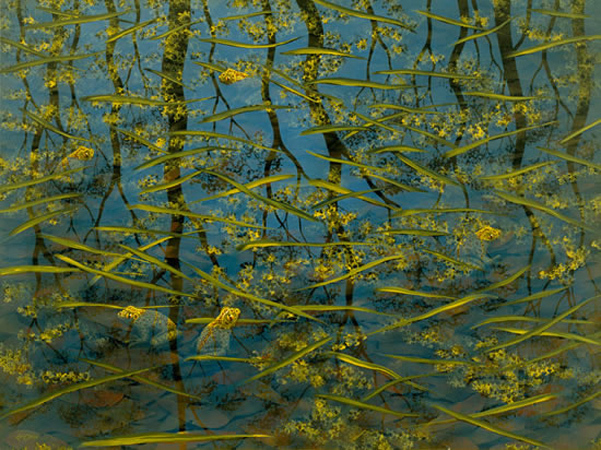 Lin Onus fine art prints, etchings, silkscreens, paintings at Etching House. Etching House specilaise in Lin Onus Fine Art, etchings and prints. Fine Art Etchings and Prints by Lin Onus at Etching House Weekend Australian Affordable Art Fair Sydney and Melbourne. Lin Onus collection of art at Etching House. In Stock, Lin Onus limited edition fine art copyright reproduction prints of original paintings available at Etching House. Each work comes with a certificate of Authenticity and has the family embossed copyright crest of Lin Onus Estate.